001.Lederman, Russet – JavaMuseum 2010 – Celebrate! Russet Lederman received a Masters of Fine Arts degree in Computer Art from the School of Visual Arts, New York City in 1999 and is currently pursuing her M.A/Ph.D track in Media Studies at The New School University, NYC. Recently, she collaborated on events and screening for Franklin Furnace Archives and the X/Fest Experimental Video Festival. In 2001-2002, she was awarded the Smithsonian American Art Museum’s New Media/New Century Award, a commission to create a fine art web work about the American landscape for the museum’s web site. 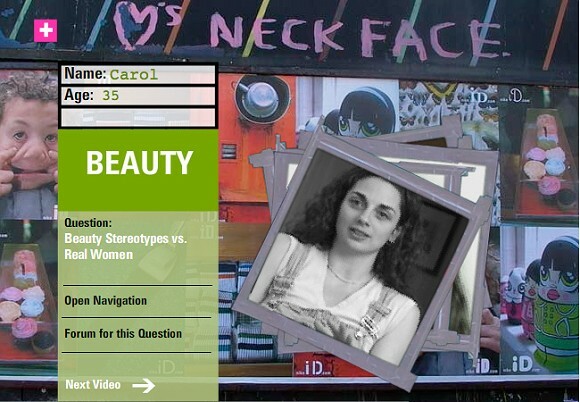 Barely Skin Deep is an interactive online documentary video project, which explores the concept of feminine beauty from the perspective of 10 diverse women. Using video interviews collected over a 4-year period, this documentary work seeks to present a fragmented, pluralistic perspective on the personal and societal issues which influence a woman’s concept of self and group beauty. About 4 years ago, I sought to uncover a range of personal viewpoints and experiences on this topic by video interviewing women from various ages and cultural backgrounds. At the time, I was unsure how I would use the footage. I approach fine art projects in a fairly organic manner: I collect material and then see what issues are revealed. As a result of seeing the vastly different perspectives presented in the interviews, I decided to create an online interactive work. This enables the viewer to access and evaluate these fragmented interviews in order to formulate his/her own opinion based on the presented materials. Each interview fragment is 10 to 60 seconds and is retrieved from a database of over 200 clips using the XML language in a Flash interface. One of the key issues discovered as I was working on this project was that different people want to access the material from this database in different ways. As a result, the interview clips can be viewed by either interviewee or by one of 9 topics, where the viewer has the ability to further define the viewing constraints by selecting a specific interview question. In addition to the database clips, the viewer can also access background information on each interviewee in the Women section. Through a Forum section they can also participate in discussions related to the topics covered in the database interviews.